The film opens in striking fashion with a shot of the weapon that inspired the film's title. When fitted with an additional piece, the bow becomes a stringed instrument. Sadly, however, the instrument doesn't fit into the film's plot beyond providing for occasional mood music. The bow is utilized more often as a means of fending off lecherous fisherman from the young girl, who braves the dead of winter in a flimsy dress, and who (like all the women in Kim's films) is pretty gorgeous. Soon, however, a sensitive male college student shows up on board, and the old man discovers he's going to need more than a bow if he wants to keep the delectable young thing for himself. One of Kim's most common approaches to storytelling is to set up an isolated or marginalized world (usually a physical space, but sometimes a way of life like in 3-Iron) that operates by its own elaborate set of rules and customs. Examples include the red-light district in Bad Guy, the lake in The Isle, the motel in Birdcage Inn, or the floating temple in Spring, Summer, etc... Part of the pleasure in watching his films comes in exploring and coming to understand these worlds and how they operate. 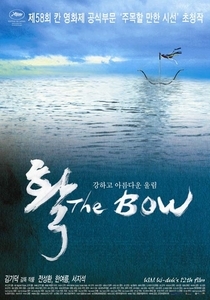 For example, in The Bow we are shown how the girl and the old man defend themselves in a series of repeated scenes. First we are shown the man's skill with the bow, then we see how the girl's spatial knowledge of the boat and archery skills can serve as a second layer of defense. These scenes don't really add much depth to the human characters, but they characterize the "society" of the boat itself. This is compounded by the fact that the two main characters do not speak to each other. It's true that one of Kim's strengths is to be able to tell stories using very little dialogue. The lack of dialogue between the leads in The Isle and 3-Iron worked well because these couples could communicate with each other emotionally, and the absence of words only accentuated their strange bond. However, in The Bow the old man and the girl spend much of the film growing emotionally more detached. Since they don't talk, the only way left for them to communicate is to trade angry stares, which they do, over and over and over again. In this way, the lack of dialogue comes across feeling more like a gimmick than an integral part of the film.